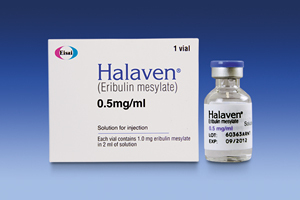 HATFIELD, UK 10 July 2012 – Halaven® (eribulin), a novel treatment for patients with locally advanced or metastatic breast cancer who have progressed after at least two chemotherapeutic regimens for advanced disease, has recently received registration approval from the Israeli health authorities. Prior therapy should have included two common types of chemotherapy, an anthracycline and a taxane, unless patients were not suitable for these treatments. Eribulin has been proven to significantly extend overall survival in patients with metastatic breast cancer, compared to other single agent chemotherapies. [i] Following marketing authorisation, Eisai and Neopharm group, its partner in Israel, plan to launch the product by the end of Eisai’s financial year 2012 (31 March 2013). The Israeli launch of eribulin will allow access for women to a treatment not previously available to them and further supports Eisai’s human health care (hhc) mission to satisfy unmet medical needs and contribute to the health and well being of people worldwide. Eisai is dedicated to discovering, developing and producing innovative oncology therapies that can help make a difference and impact the lives of patients and their families. Eisai is one of the world’s leading R&D-based pharmaceutical companies and has defined its corporate mission as “giving first thought to patients and their families and to increasing the benefits health care provides,” which we call human health care (hhc). Eisai recently expanded their UK Hatfield facility which now supports the company’s growing European, Middle Eastern, African and Russian (EMEA) business. With operations in the U.S., Asia, Europe and its domestic home market of Japan, Eisai employs more than 11,000 people worldwide. In Europe, Eisai undertakes sales and marketing operations in over 20 markets, including the United Kingdom, France, Germany, Italy, Spain, Switzerland, Sweden, Ireland, Austria, Denmark, Finland, Norway, Portugal, Iceland, Czech Republic, Slovakia, the Netherlands, Belgium, Luxembourg, Middle East and Russia.